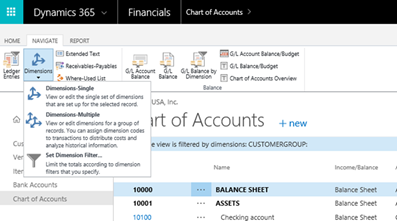 We are pleased to share our recent updates made available in the July update of Dynamics 365 for Financials. You can now use the average costing method to valuate inventory. When using this costing method, the unit cost of an item is calculated as the average cost at the time of each purchase per item or per item per location. This average cost is calculated using a periodic weighted average, with options for day, week, month, or accounting period. 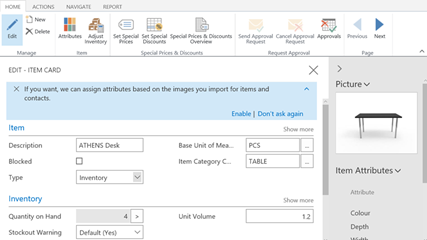 Using Microsoft Cognitive Services, images of contacts and items can now be analyzed automatically to assign relevant attributes and categories. The image analyzer can automatically recognize your contacts’ gender or age, and your items’ type and color. After the image analysis has been completed, you can manually select whether found factors are relevant and whether they should be assigned as attribute or category. Analyze data with dimensions in all Entries windows and in the Chart of Accounts by filtering by dimensions. This filter allows you to slice and dice ledger entries and G/L account totals by setting filters on dimensions—allowing you to track, troubleshoot, or report on transactional data quickly. The accountant portal now includes company detail pages and an option to invite external accountants directly. The detailed page shows more KPI details for a client company, such as purchases, sales, cash flow forecasts, and cash balances. From the detailed page, accountants can drill down to their clients’ specific transaction details. In addition, a new wizard automates the process of inviting an accountant to a client’s tenant. 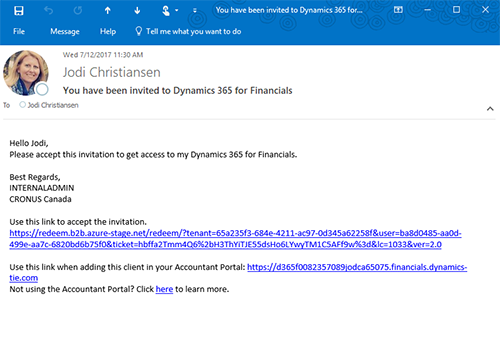 Completing the ‘Invite External Accountant’ wizard sends an email to the accountant with a link that lets them accept the invitation with a single click. In the United Kingdom, users can now set up a connection with HMRC’s GovTalk Gateway in the Service Connections window to submit VAT returns. After HMRC processes and accepts the submitted VAT return, the status is changed to ‘Accepted’ automatically and the user is notified by email. Afterwards, the user can post the VAT settlement for the given period automatically. • The approval workflow status field has been added to purchase invoice cards. • The action dimension tag has been added to the transfer order subpage, allowing users to choose a dimension for lines. • You can now combine shipments received on several orders into one invoice. • Previously, when you made changes on the My Settings page, such as switching your Role Center or company, you had to sign out and in again before you could see the changes. Now, you no longer have to do this because changes will take effect immediately. Please continue to provide feedback on https://ideas.dynamics.com/ideas/dynamics-financials.